The Spirit Burgundy Rectangular Rug from Goods of the Woods, Model No. 11026, is a beautifully designed and precisely crafted piece of home decor. 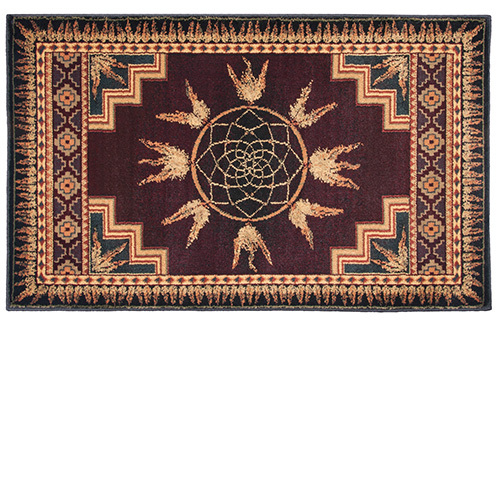 This lovely hearth rug features a gorgeous Aztec Tribal pattern that is certain to impress anyone and everyone. Take your fireplace from boring to beautiful with the Spirit Burgundy Rectangular Rug, which is stain resistant. Maintenance is a breeze -- simply clean with a damp cloth. The Spirit Burgundy Rug measures 30 inches wide and 50 inches long and is durable and long lasting. This rug is 50" x 30". What are the dimension of the rug? This rug measures 30" x 50". We searched several local stores for a fireplace rug and this Goods of the Woods rug surpassed them all by far. It�€™s not too thin and is very good quality. Just wished it were a little wider. Strongly recommend it! While being functional it's also a beautiful addition to your home. I am very please with this product. Quality is great, it's a beautiful rug and looks great in front of our fireplace. Perfect fit & finish. Seems to catch hot sparks without any burn igniting. Beautiful & Useful Rug. Looks Great in front of the wood stove. A great addition to the room. Quality exceeded expectations. Rug adds a great finishing touch to fireplace hearth. Awesome hearth rug matches our other rugs from eFireplace store. Thanks for the fast shipping. I was very happy with my rug and I received it a lot quicker then I thought I would. If I need another rug, I will be ordering again from this company. I love this rug!!! I love the design and the fact that it's not all hard and scratchy! It's very soft and comfortable. Even my cats love laying on it in front of the fire!! It's already saved my carpet from a burn, which is what it's designed to do! I love it and I would buy another one anytime!! Consonly thing is that I wish I could have gotten one a little bit bigger! Other than that, it's perfect! The hearth rug I ordered is even nicer than I thought it would be. Great quality and appearance.